It's not often that a stand-up comedy show includes a ticketing option for "lawn seats," and, quite frankly, I can't imagine a lot of stand-ups would be at their most thrilling in such a setting. But Funny or Die's Oddball Comedy Festival has made outdoor-arena seating work for a crop of indie comics gone big. The festival got off to a rollicking start last year because it marked Dave Chappelle's high-profile return (complete with a high-profile onstage "meltdown," as it was called, in Hartford). 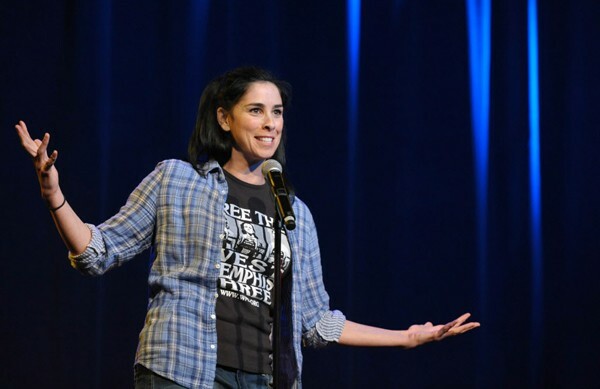 This year's cast of rotating headliners features a lot of lady power, and some big names are coming to Chicago with Sarah Silverman and Amy Schumer topping the bill. Bill Burr, Hannibal Buress, Michael Che, Jim Jefferies, and Chris Hardwick round out the lineup, and a side stage hosted by Brody Stevens touts up-and-coming comics who were chosen during the Road to Oddball tour earlier this year. A lineup this packed is usually spread out in theaters and small clubs over a week or longer, but Oddball instead books a one-day extravaganza in a huge outdoor venue—maybe playing to its name a bit. The festival is smartly booked; every performer is dynamic enough to handle a large crowd without venturing into Dane-Cook-yelling-at-the-top-of-his-lungs territory. (It may sound like Burr is yelling, but he's not—he's just a passionate talker.) Silverman and Schumer are queens of brazen humor, Hardwick is dorky and charming away from his TV-host persona, and hometown boy Buress's career is on an uptick—to put it mildly—since he taped his Comedy Central special here in October and snagged a scene-stealing role on the well-hyped Broad City. All in all, I don't suspect any of the comics will struggle to get laughs from the quilt loungers on the back of the lawn.